Anyone wishing to Contribute to the Vaiden Page is encouraged to do so. If you have information or photos concerning Vaiden, Mississippi, Gerenton, Middleton, Shongalo, Midway, Blackmonton, or Carroll County, please contact me. I don’t want to keep any photos, and I will return them to you as soon as practicable after they are scanned. Of course, your name will be listed on my Credits Page as a contributor. In addition to photos, Please include a description of the subject of the photo, and an approximate date, if possible. I certainly do not want to leave out any photos dedicated to the Memory of a Loved One. Any family photos that you would like to contribute, please do so. Keep in mind that I will return these photos to you, unless you tell me that there is no need to. 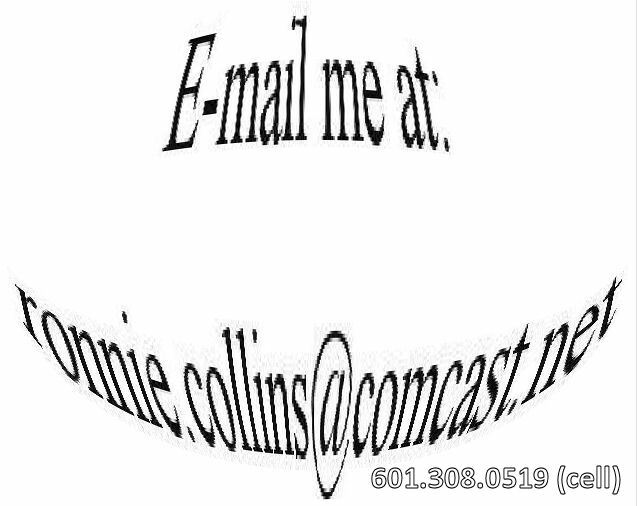 I will NOT list anyone’s address or phone number on the internet unless specifically requested to do so in writing. Send all photos in a .gif or .jpg, .tiff or .bmp format (.gif or .jpg would take less time to send). Send all typed information in Microsoft Word or Corel WordPerfect format. Save your document in the .doc format (Word) or the .wpd format (WordPerfect). DO NOT convert a document into Web Page format (.htm or .html). Please make the pictures as large as possible; I would rather have to reduce them in size, than make them grainy in appearance by enlarging them. Also, please understand that I am not a Genealogist (at least, at the moment). I will be glad to help in any way I can, but you would be better served by contacting the Mississippi Department of Archives and History, the MS GenWeb Project, Lineages, or the Mississippi Department of Vital Records. PLEASE DO NOT CONTACT ME asking for help with your computer. I work on computers all day on my job. Sorry, but the last thing I want is to have to spend my off-time solving computer problems. If you’ve gotten this far and you’re having computer problems, you should be able to solve them yourselves. I am doing this free of charge, and have spent endless hours in the process. Spend a few of your own, and record your history for generations to come. My theory is this: One day we will all be gone. Future generations of our family (or strangers, robbers, etc.) will find photos of Vaiden in our closets, will not know what they are, and the glorious photos of Vaiden – the town and its people – will be thrown in the garbage. HELP PRESERVE OUR TOWN. A copy of the VAIDEN Site will be periodically given to the Mississippi Department of Archives and History on a CD or DVD, to be enjoyed by generations to come. [Ed. Note: This photo was sent to me by Genie Buffaloe. The man on the left is thought to be William A. Buffaloe or Rufus Franklin, and the other next to him could be his half-brother, Thurman. Rufus Franklin was born May 14, 1867, and married Dora Landrumn Jackson on August 5, 188? If you know whose store this is, please E-mail me, or Genie Buffaloe at buffher@swbell.net. 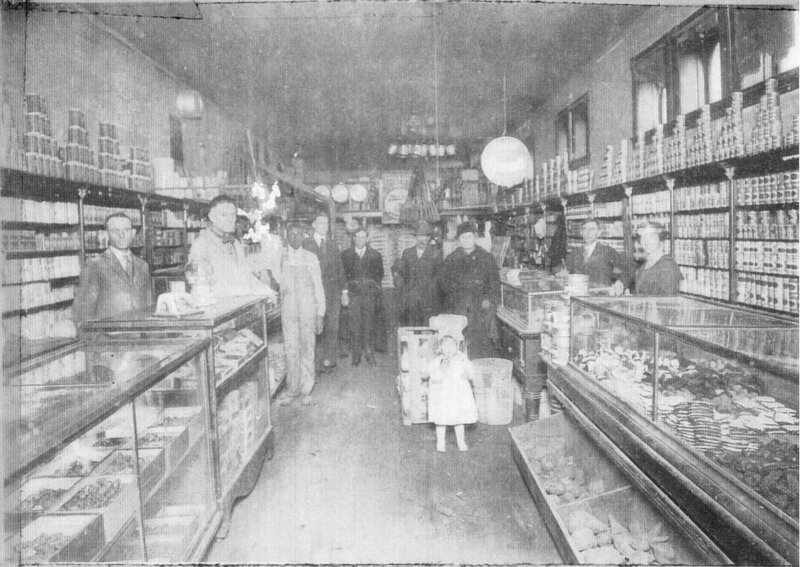 One key to the identity of this store lies in its windows, as seen toward the ceiling. What store in Vaiden had windows close to the ceiling? This store might have been a 2-story store, but it is uncertain. Braswell’s (in the old Vaiden, Kopperl & Hawkins Building – or the building itself) – also, when was this torn down? Law Offices (Shands/Boykin/Gilmer) (the one by the front street Post Office, the one over Lee’s Grocery, and the one on the 2nd Floor of the 1905 Courthouse. Summers’ Grocery (before it burned in the early 60s)/Leo Tindall’s Store – WHEN DID IT BURN ? Buildings next to Summers’ Grocery on Back Street – Pool Hall, etc. WHEN DID THEY BURN ? 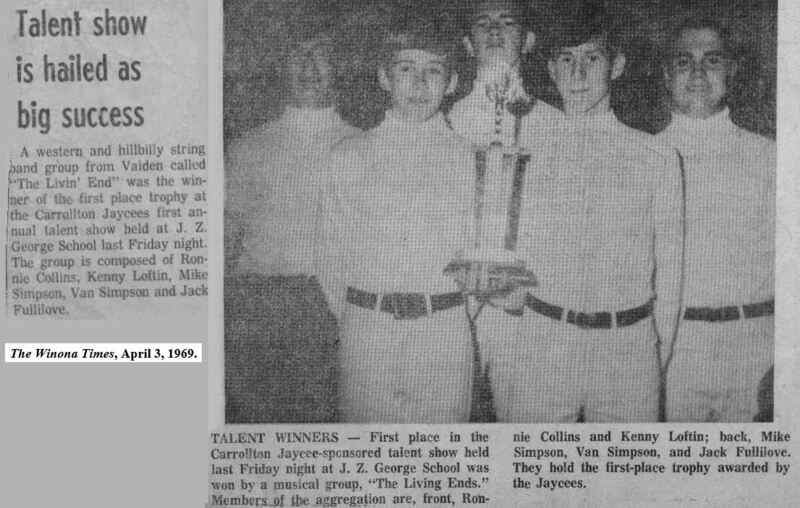 ANY pictures of the band The “Livin End” (Photo 1 – Photo 2) or “Magnolia Blue.” The Livin End included Jack Fullilove, Ronnie Collins, Kenny Loftin, Van Simpson and Mike Simpson. Magnolia Blue included Kenny Loftin, Larry Parker, Van Simpson, Eddie Mikell, Earl Bishop Aldridge and Ronnie Collins. These photos can be of a live event, or just an individual or group photo. 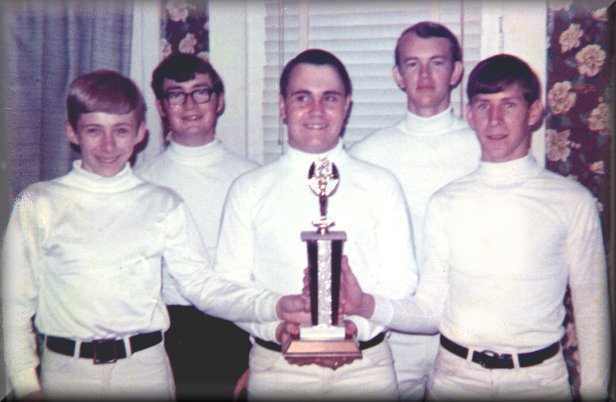 Any pictures of the band “Coldfire.” Coldfire included Kenny Loftin, James Allen Gant, and Ronnie Collins. Pictures of the original Vaiden High School (demolished around 1947), or any events, group or class photos, etc. that were taken at this school or on the school property. Does anyone reading this page have ANY films of Vaiden High Bulldogs football games? – NOTE: the following Monday after a game, the football players would sometimes gather and watch films of the game to point out any mistakes that were made and to improve the offense/defense for future games. Where did these films go? Do you have a copy? If they still exist, a copy of them would be great. When I was in the 10th Grade (1969-1970), I was manager of the Vaiden Bulldogs Football Team. My Assistant Manager was Kenny King. I can distinctly remember sitting through several of these. Pictures of any Vaiden Graduation – no matter what year it is. Football, Basketball, & Track schedules & records with wins/losses & scores for as many years as possible, including any bowl bids – pictures too !!! Yearbooks (“Annuals”) of the Vaiden School – I already have the issues for 1957, 1963, 1964, 1965, 1966, 1967, 1968, 1969 and 1970. Any issues other than the ones I have would be greatly appreciated. You will get these back, but it may take a while for me to scan them. Each and every page of each and every Vaiden School annual that is available is currently being scanned and posted to the website by the years as listed on the annual covers. See these at http://www.vaiden.net/vaiden_annuals.html. Some years might not have yearbooks, but I’ll post them if they exist. Specifically, the yearbooks (annuals) that are needed – if they exist - are for all years BEFORE (but not including) 1957 and 1958, 1959, 1960, 1961, 1962, 1971, 1972, 1973, 1974, 1975, 1976, 1977, 1978, 1979, 1980, 1981, 1982, 1983, 1984, 1985, 1986, 1987, 1988, 1989, 1990, 1991, 1992, 1993, 1994, 1995, 1996, 1997, 1997 and 1999 (Vaiden’s last year). Vaiden’s first school opened in 1860 – the same year the Civil War started. If you once lived in Vaiden (or still do), this will apply to you: Some of the older homes had FAMILY NAMES on the steps in front of them, or the sidewalk in front of them. Did yours? Do you have a picture of this? Often, the family names would be on the top step or on the sidewalk leading up to your house. One example of this can still be seen (I believe) on at the start of the sidewalk going to the house of the former Herman and Vera Johnson. This house sits directly behind the Vaiden Presbyterian Church (a picture of this will be provided at a later date). Pictures of the Vaiden Colored School, formerly located on the hill by the Vaiden Cemetery and later (around 1964-1967) to Highway 51 north, where it was used as the Vaiden Community Center (by the baseball field) and any school “annuals” or student pictures that might be available. Pictures taken at football games that show the bleachers, concession stand, football field, etc. Any pictures of merchants, customers, stores, visitors, etc. John Z. Herring House (at intersection of Hwy. 35 and Hwy. 430) – I believe this house was torn down in the mid to late 1960s. Small house directly across the street from the house listed above). Pictures of any of the houses that were blown away in the 1990 tornado (Felice Fisher’s house, Dudley Stewart’s house, Sybil Stewart’s house, Mayor Wiley’s house, etc.). Businesses down Highway 51 south – includes inns, service stations, restaurants, etc. – ANYTHING !!! Information about the stagecoach routes through Shongalo and the Vaiden areas – where did they originate; where was their destination; when did they run; who drove them; how long were they in business; did they carry money as well as passengers ?? Sound Like a lot ?? You ain’t seen nothing yet !! !